Calpains are signaling proteases that have relatively little sequence specificity but some preferences for certain residues on either side of the scissile bond. As with most proteases, they mainly cut unstructured or extended regions of their target proteins. 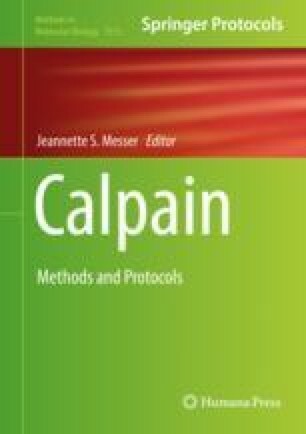 The tendency for concentrated calpain to rapidly autoproteolyze when activated by calcium complicates the kinetic assessment of calpain activity. As calpain autoproteolyzes, the amount of fully active enzyme continuously decreases until all of the calpain molecules have been cut and their activity reduced to a tiny fraction of the starting rate. To accurately measure calpain kinetics, only the initial rate of substrate hydrolysis, where autoproteolysis is minimal, can be used. To accomplish this, a method for rapid, quantifiable determination of substrate cleavage is required. Many of the existing assays are lacking in their sensitivity to accurately quantify calpain activity within this timeframe. However, the FRET peptide substrates developed by Cuerrier et al. have been shown to have sufficiently high affinity between substrate and enzyme to accurately measure the initial enzyme reaction velocity at substrate concentrations above the Km value. With a suitably sensitive fluorimeter, sufficient data can be obtained to evaluate calpain kinetics and inhibition. Here we describe a facile, reliable calpain assay based on the continuous monitoring of FRET fluorescence from the highly sensitive calpain-specific substrate, (EDANS)-EPLFAERK-(DABCYL). We illustrate some difficulties associated with determining kinetic constants of whole calpains that are simultaneously undergoing autoproteolysis and how the assay can be used to help characterize calpain-specific inhibitors. We also present a variation of this fluorescence-based assay for high-throughput screening using the calpain protease core and a fluorescence plate reader. CM would like to acknowledge the instruction and guidance provided by Dr. Kristin Low. This work was supported by the Canadian Institutes of Health Research. PLD holds a Canada Research Chair in Protein Engineering.